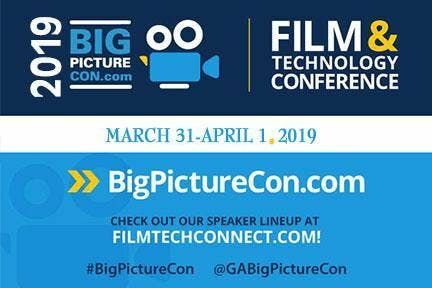 Don't miss the BigPictureCon Film & Technology Conference + Short Film Festival, returning to Atlanta 2019! Film Festival Call for Entries opens August 1, 2018. Conference Registration opens November 1, 2018. The BigPictureCon Film & Technology Conference + Short Film Festival consists of two days of workshops, panel discussions, screenings, demos, and seminars on topics of film education, networking, and professional development in the Film and digital entertainment technology industries. 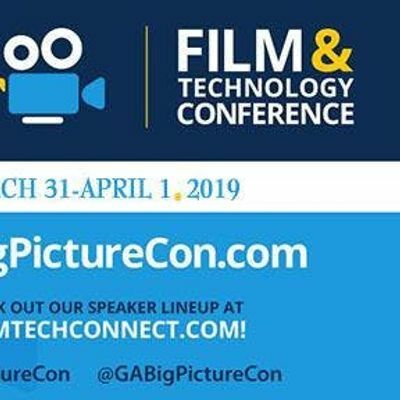 The next conference will be held on March 31-April 1, 2019 and is geared for emerging and student filmmakers and content creators, as well as newcomers to the film and video production industry in Georgia. We are committed to helping you find support and success in Georgia. Conference session topics range from directing, editing, large format filmmaking, graphics, visual media, stunt acting & directing for the camera, and networking, to film financing, budgeting, producing across multiple platforms, marketing and distribution. Registration is open to anyone working in, studying, or interested in the fields of film, video, or any visual media. Sponsorship, volunteer and on-campus student ambassador opportunities are still available! Contact us at 770-354-4027, or c3VwcG9ydCB8IGJpZ3BpY3R1cmVmZG4gISBvcmc= for details. DOOR PRIZES: Only one raffle ticket per attendee. Duplicate tickets may disqualify a door prize winner. No purchase necessary, void where prohibited. Open to legal US residents 16 and older. Must be present to win, winners potentially subject to identity verification. PHOTO RELEASE/DISCLAIMER: Participation/Attendance in/of the event jointly and severally grants to THE BIG PICTURE FILM & VIDEO FOUNDATION and its subsidiaries, affiliates, and related entities (collectively "Owner") the absolute and irrevocable right and unrestricted permission to use, re-use, display, distribute, transmit, publish, re-publish, copy, or otherwise exploit, either in whole or in part, either digitally, in print, or in any other medium now or hereafter known, for any purpose whatsoever, and without restriction, photographs and/or video taken of me, or in or which may be included (collectively "Photographs"); and to alter the same without restriction, and to copyright the same by participating. Your company understands and agrees that owner may or may not use your company's name in conjunction with the photographs as determined in its sole and absolute discretion. Beginning January 1, 2019, you can use discount code: BPC2010 for 20% off ALL ACCESS Passes ! Individual session tickets also available for $10 ea. Mix and match for your own customized program!